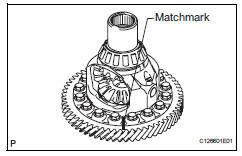 Place the matchmarks on the ring gear and differential case. 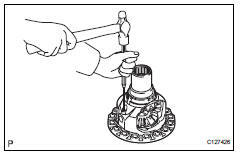 Using a plastic-faced hammer, tap on the ring gear to remove it from the case. 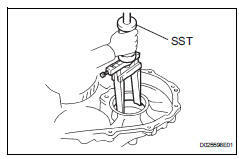 Using sst, tap out the front differential case front tapered roller bearing from the differential case. Using sst, remove the front differential case front tapered roller bearing outer race. 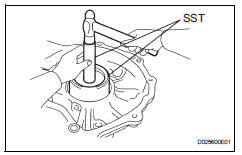 Using sst, remove the front differential case rear tapered roller bearing from the differential case. 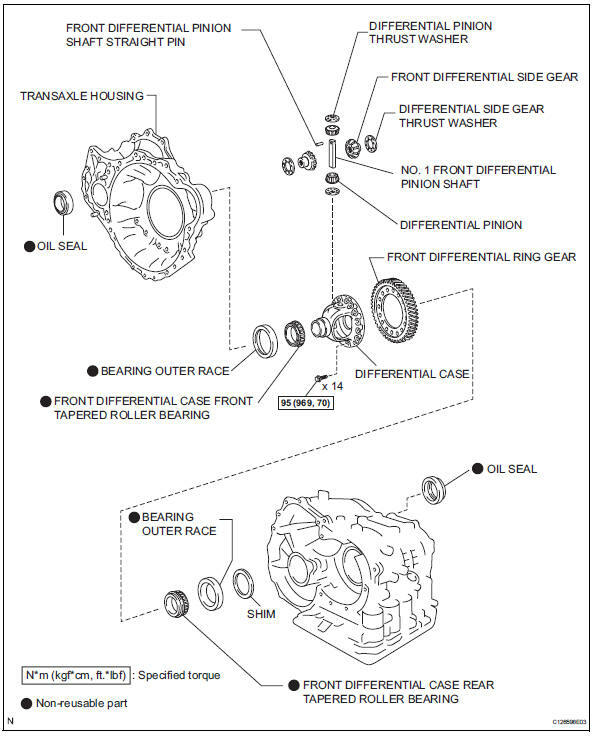 Using sst, tap out the front differential case front tapered roller bearing outer race. Using a pin punch and hammer, tap in the straight pin. Before removing the straight pin, unstake it with a pin punch. 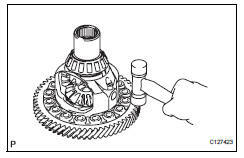 Remove the front differential pinion shaft from the differential case. 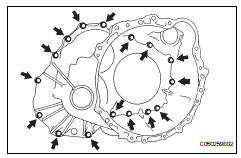 Remove the 2 front differential pinions, 2 pinion thrust washers, 2 front differential side gears and 2 side gear thrust washers from the differential case. 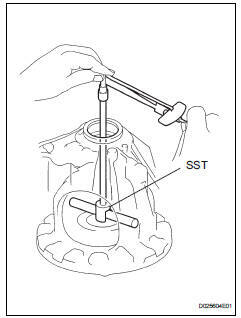 Using sst and hammer, tap out the oil seal. 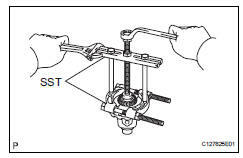 Using a dial indicator, measure the backlash of the side gear. 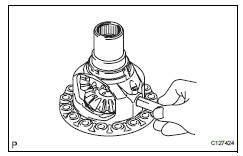 Coat the 2 front differential side gears, 2 side gear thrust washers, 2 font differential pinions and 2 pinion thrust washers with atf and install them to the differential case. Coat the no. 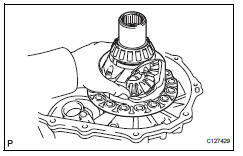 1 Front differential pinion shaft with atf, and install it to the differential case. Using a pin punch and a hammer, tap in the pinion shaft straight pin. Using a chisel and a hammer, stake the differential case. Stake it after adjusting the backlash. 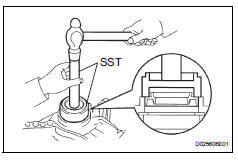 Using sst and a press, press in the front differential case rear tapered roller bearing to the differential case. Using sst and a hammer, tap in the front differential case tapered roller bearing front outer race to the transaxle housing. 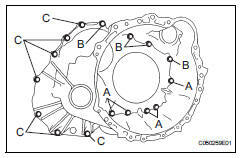 Clearance is not allowed between the bearing and transaxle housing. 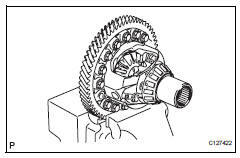 Install the differential assembly to the transaxle case. Clean the matching surfaces of the transaxle case and transaxle housing. 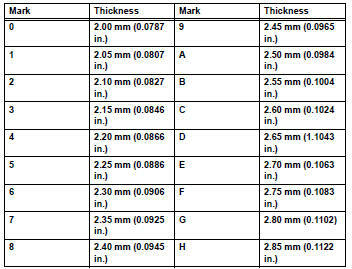 Each bolt length is indicated below. 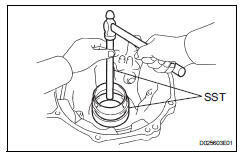 Usually, bolt a is non-reusable bolt. In this case, however, it can be used after cleaning it. 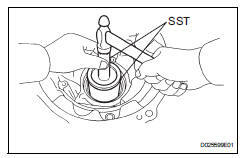 Using sst, return the differential assembly right and left 2 or 3 times to allow the bearing settle. 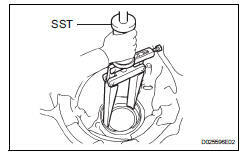 Using sst and torque wrench, measure the turning torque of the differential. 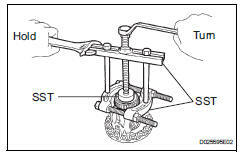 If the turning torque is not within the specified value, refer to the table below and select a thrust washer which turning torque is within the specified value. 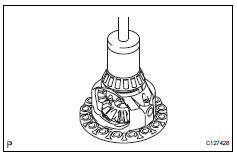 Remove the 16 bolts and the transaxle housing. 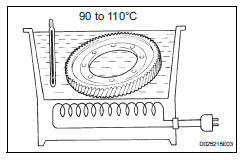 Do not overheat the ring gear to 110°c (230.0°F) or more. Clean the contract surface of the front differential case. 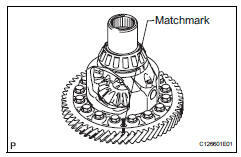 Align the matchmarks, and install the front differential ring gear case quickly. 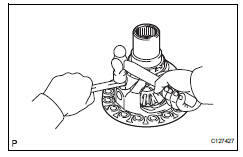 Do not install the bolts while the ring gear is hot. Tighten the bolts a little at a time in diagonal order. Coat the lip of a new oil seal with a little amount of mp grease.